(i) crystals of copper sulphate from metallic copper ? (ii) Calcium chloride from Marble (calcium carbonate) ? (ii) Calcium chloride can be obtained by treating marble (Calcium Carbonate) with hydrochloric acid. Question: What is an oxide? Answer: An oxide is the compound of an element with oxygen. For example - water is an oxide of hydrogen, Rust is an oxide of iron. Question: Name there types of oxides with their properties. Non-metals burn in oxygen and form acidic oxides. Such oxides turn blue litmus red like - Carbon dioxide (CO2), Sulphur dioxide (SO2). The oxides which on treatment with water form alkalines are known as basic oxides. Metallic oxides are mostly basic oxides which turn red litmus blue. For example - Na2O, MgO etc. The oxides which show the properties of both acidic and basic oxides are known as amphoteric oxides for example, Al2O3, SO2 etc. Question: What is acid ? (Write definition of acids with their examples) How acids are produced? Answer: Acids are the chemicals which contain hydrogen atom and are sour in taste. Acids are produced when oxides of non-metals react with water. Examples of some common acids are - HCl (Hydrochloric Acid), H2SO4 (Sulphuric Acid), HNO3 (Nitric Acid). Question: Why are mineral acids dangerous? Answer: Mineral Acids are very strong acids and are mostly used in industries other than laboratories. Being strong acids they are corrosive in nature. Such acids need to be handled very carefully as they can easily corrode skin, human body, metals, clothes and all coming in contact. Hence, mineral acids are dangerous. Some examples of mineral acids are - hydrochloric acid, sulphuric acid, nitric acid, etc. Question: What are organic acids ? Name some organic acids, which are used as food ingredients. Answer: Acids which contain -COOH functional groups are termed as organic acids. Organic acids are weak acids and are present in animal and plant materials. Examples of organic acids used as food ingredients - acetic acid, citric acid (C6H8O7), tartaric acid. Question: What are the differences between Dilute and Concentrated acids ? 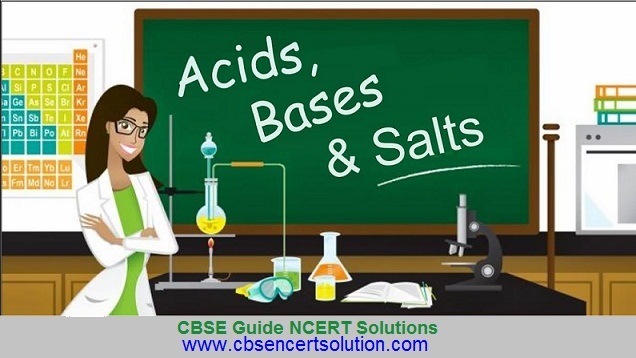 Answer: Dilute acid - A dilute acid solution is one which contains only small amount of solute or its solution diluted to a definite strength is called dilute acid. Concentrated Acid - A concentrated acid is one which contains a high proportion of solute. (c) Which is called "the king of chemicals"
Answer: (a) acetic acid. (b) citric acid. (c) sulphuric acid. (d) deliquescence. Question: What are bases ? Give the characteristics of bases. Answer: Bases are the hydroxide of metals, which give up hydroxide ion after dissociation in aqueous solution. Turn red litmus to blue. React with acid to form salt and water. Bases are soluble in water and known as alkalies. Question: What are Acids ? Give some characteristics of acids. Turn blue litmus to red. Dilution of acid in water is an exothermic reaction (heat evolves). React with metals to evolve hydrogen gas. React with bases to form salt and water. The process called, neutralisation. React with basic oxides to form salt and water. React with carbonates to form salt, water and carbon dioxide.